Southeast Alaska is one of the most beautiful places in the world. 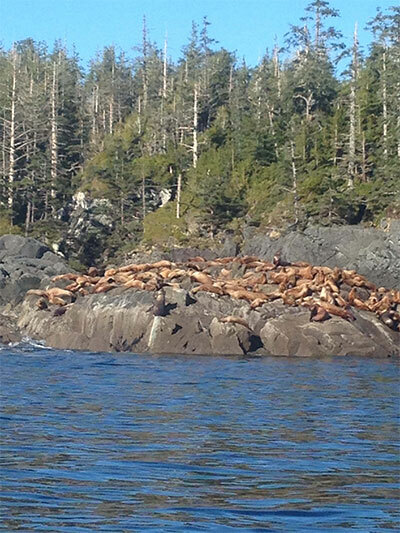 With an abundance of wildlife on both land and in the sea, Ketchikan is the perfect place for an off-ship excursion. At Anglers Adventures & Outfitters, we aim to make all of our Alaskan cruise excursions an experience our clients won’t soon forget. We offer chartered fishing trips through the best fishing waters around, as well as guided whale (and other wildlife) watching excursions. Anglers Adventures & Outfitters is the perfect choice for anyone wanting to explore all that Alaska has to offer. Day trips are a popular choice for those on a cruise visiting Ketchikan and really wanting to take in the sites. When you book a charter with us you have the ability to customize your excursions however you’d like. Whether you want to spend the day chasing whales and photographing sea lions, or reeling in a large King Salmon, our day trip excursions are meant to bring meaningful and fulfilling experiences to everyone that comes aboard. Many people have said it’s the highlight of their cruise! Anglers Adventures & Outfitters is best known for our fantastic fishing charter excursions. Catching that big fish you’ve always dreamed of is one of the largest reasons people visit in Ketchikan. Brian, your Captain, understands this desire his guests have and is an expert at giving his passengers the best opportunities to find their trophy fish. Our fishing day trips will typically have a target fish they choose to pursue. Depending on the time of year, salmon, halibut and rockfish tend to be our most popular day trip excursions. With one of the best fishing spots in Alaska, fishing in this area is so much fun. Our fishing boat provides all the essential gear, all of the bait, tackle, and lures, and also plenty of snacks and drinks to keep you ready and energized to reel in that big fish. Oh and did we mention the professional instruction and guidance that Brian brings to the table? His knowledge and experience in fishing has many of our guests coming back for more. Not only do we offer fishing charters and excursions, our sight-seeing is one for the books. With sea lions swimming under our boats and killer whales competing with us for King Salmon, our boat absolutely knows how to capture marine life at its finest. If you have always wanted to go whale watching, Anglers Adventures & Outfitters can get you up close and personal. Nothing is impossible, and we do our best to give you that once in a lifetime experience. Checking out all the beautiful wildlife that Ketchikan, Alaska has to offer is best done on a boat that can handle the waters but not scare the wildlife away! When you choose Anglers Adventures & Outfitters for your Alaskan Cruise excursion, you get to set off on your day trip at a beautiful cove that offers the perfect location for fishing and sightseeing. Knudson Cove is a short drive away from downtown but is far enough away that the waterway is clear and the wildlife is active. Before you ever board any type of vessel out on the Alaskan waters, it’s important to know that your safety is in good hands. Brian Ringeisen, Captain of Anglers Adventures and your trusted guide and professional Angler, prioritizes everyone’s safety as his top priority. As a former US Coast Guard, Brian is CPR certified, First Aid Certified, and knows these waters like the back of his hands. He is more than equipped to handle the Alaskan waters and always is looking for ways to ensure his passengers have a fantastic time. Our boat is stocked with all the bells and whistles of your modern day fishermen. Our F/V Sierra Dawn is a 28’ Bayline Trophy that comfortably accommodates guests all day long. Specific to our fishing excursions, this boat has a chartplotter, GPS, depth sounders, and 4 brand new Scotty electric downriggers equipped with rod holders. The boat also has a nice, heated enclosed cabin and a private bathroom to make an entire day trip more comfortable and accommodating. If you are looking for an Alaskan Cruise Excursion that allows you a more up close and personal view of the Southeast Alaskan waters, contact Anglers Adventures & Outfitters today. For more information about our day trips during your cruise, give us a call today at (907) 254-0880.